One of animals' most primal senses is that of smell. If you look at a rat brain, the olfactory bulbs (the two little notches at the top) take up a significant portion of the total surface area. In the human brain, the piriform cortex (our primary olfactory cortex) is composed of three primitive layers, unlike the more evolutionarily-advanced six layers that most of our cortex contains. Of course, we humans have perfected our more "important" senses of sight, smell, and touch over the years. That's why we don't smell as well as bloodhounds, and why we don't have these gigantic notches sticking out of our brains. But we do have olfactory bulbs, albeit significantly smaller, located within the bony cribriform plate in our noses. When we smell something, the odorants stimulate olfactory receptor cells. These receptor cells are fascinating because they have different affinities for a wide range of odorants. The axons from these receptor cells converge in the olfactory bulb, which forms the olfactory tract and converges in the piriform cortex. Now here's where things get interesting: the olfactory tract also terminates in the medial amygdala and the entorhinal cortex. 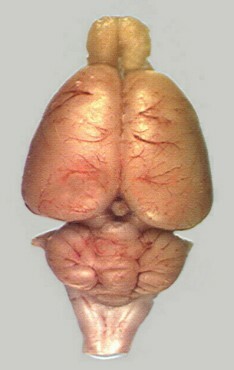 The medial amygdala is involved in emotional learning (pairing events with emotion) and is especially important in social functions such as mating. The entorhinal cortex is involved in memory; interestingly, it is one of the first regions affected by Alzheimer's disease. 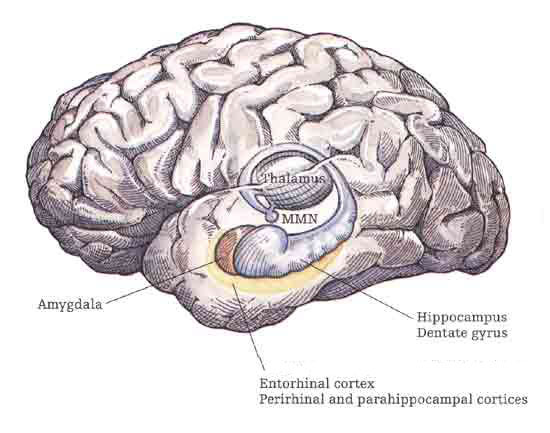 The amygdala also has a direct connection to the mammillary bodies, a region of the hypothalamus involved in recognition memory. Olfactory neurons are unmyelinated, meaning that they are not contained within a fatty sheath (myelin) that functions to speed electrical signaling. Smell is, in fact, our slowest sense. Interestingly, olfactory receptors are also our only sensory receptors exposed to the environment, suggesting their direct importance in our brain's coding of memories from our experiences and emotions. Indeed, the story is starting to come together for my friend—the odorants in the office matched those of her boyfriend's dorm room, sending the same signals via the same receptor cells to brain areas involved in memory and emotion. We call this the "Proustian phenomenon" after French writer Marcel Proust, whose novel À la recherche du temps perdu depicts a character pining over his childhood after smelling a familiar tea-soaked madeleine biscuit. By the way- do read the "Tell tale Brain" by Dr. Ramachandran. U might like it.